During Oracle Open World 2013 OTech magazine was launched. OTech is a new independent magazine for Oracle professionals. The magazine’s goal is to offer a clear perspective on Oracle technologies and the way they are put into action. As a trusted technology magazine, OTech Magazine provides opinion and analysis on the news in addition to the facts. 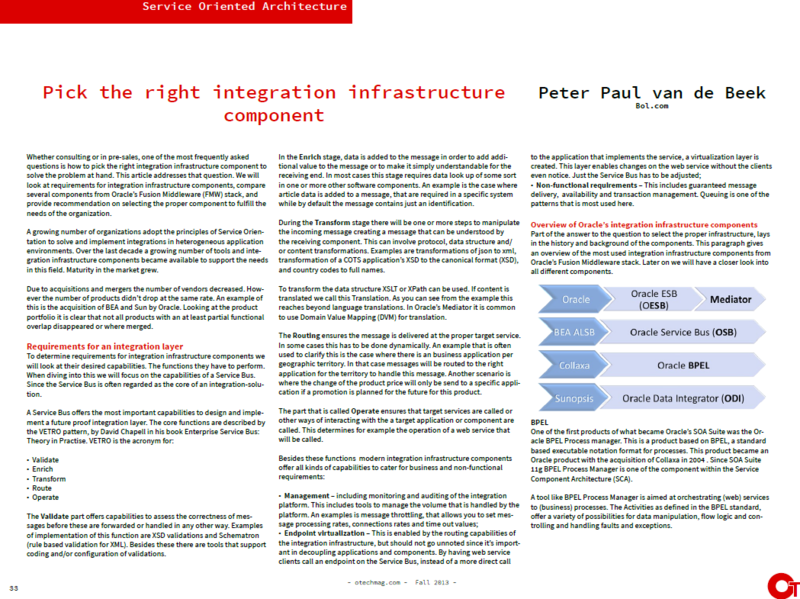 My article in OTech magazine one of the most frequently asked questions is how to pick the right integration infrastructure component to solve the problem at hand. Download the fall issue of OTech magazine. This entry was posted in BPEL, Oracle, Service Bus, Service Orientation, SOA Suite and tagged BPEL, Fusion Middleware, Service Bus, SOA on 2013/11/18 by PeterPaul. In June gartner published it’s Magic Quadrant for Application Infrastructure for Systematic SOA Infrastructure Projects. Due to the nature of SOA initiatives the selection of technologies and products aimed at supporting the implementation of the SOA infrastructure is done upfront. The resulting platform is shared among SOA applications and other integration initiatives in the enterprise. 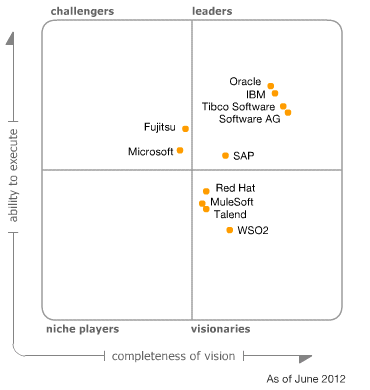 All open source vendors are in the visionary quadrant. In some cases their offerings are more modern than the Leaders’ products, since they are hardly burdened with backward compatibility issues. However these vendors are constrained by their small size or sometimes inconsistent execution. In general the open source platforms are less expensive and easier to implement and deploy. However their offerings are generally less comprehensive than the Leaders’ offerings. If these offerings fit your requirements this could be an easy-to-use/low-cost SOA infrastructure for your organisation. The open source platforms are a strong technology offering. 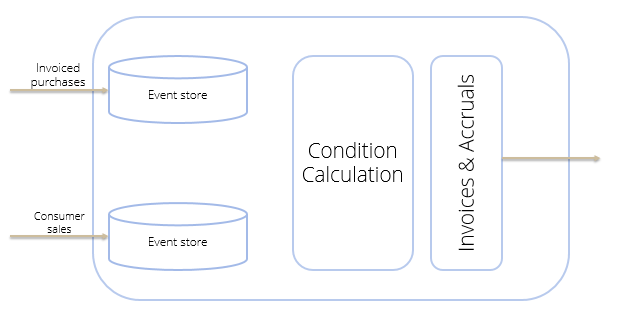 This entry was posted in Architecture, Service Orientation and tagged Architecture, Fusion Middleware, Gartner, Infrastructure, Integration on 2012/07/25 by PeterPaul. While preparing guidelines for the usage of the Oracle Service Bus (OSB) I was looking for a definition of a Service Bus. There wasn’t one on my blog yet (more posts on integration) so i decided to use the following and share them with you. An intermediary that provides core functions to makes a set of reusable services widely available, plus extended functions that simplify the use of the ESB in a real-world IT environment. An Enterprise Service Bus is seen by Erl et al as a pattern. That is why it is even more important to share what that patterns is. Later on I’ll also shortly describe the VETRO pattern. Also a very useful pattern to use when comparing integration tools or developing guide lines. Asynchronous Queuing basically an intermediary buffer, allowing service and consumers to process messages independently by remaining temporally decoupled. – Data Model transformation to convert data between disparate schema structures. – Data Format transformation to dynamically translate one data format into another. 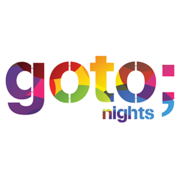 – Protocol bridging to enable communication between different communication protocols by dynamically converting one protocol to another at runtime. Intermediate routing meaning message paths can be dynamically determined through the use of intermediary routing logic. With optional the following patterns: Reliable Messaging, Policy Centralization, Rules Centralization, and Event-Driven Messaging. Also have a look at slide 12 etc of the SOA Symposium Service Bus presentation. The VETRO pattern was introduced by David Chappell, writer of the 2004 book Enterprise Service Bus. V – Validate: Validation of messages eg based on XSD or schematron. E – Enrich: Adding data from applications the message doesn’t originate from. T – Transform: Transform the data model, data format or the protocol used to send the message. R – Routing: Determine at runtime where to send the message to. E – Execute: You can see this as calling the implementation. 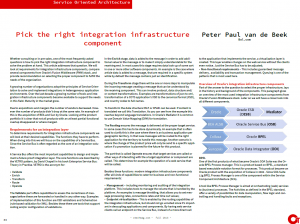 We also used this pattern to compare Oracle integration tools and infrastructure. It can be very well used while choosing the appropriate tools for a job and deciding on guidelines on how to use these tools. This entry was posted in Architecture, Patterns, Service Orientation, Tools and tagged Architecture, definition, Integration, Patterns, Service, Service Bus on 2012/04/12 by PeterPaul.